maintenance and service on all European vehicles. We are your dealer alternative for the finest maintenance and repair of high-end European world-class vehicles, including Audi, BMW, Jaguar, Mercedes, Porsche, Volvo, and Volkswagen. Lincoln Ave Auto Repair is a leading provider of repair and maintenance for high end European vehicles in the Bergen County area for the past 10 years. 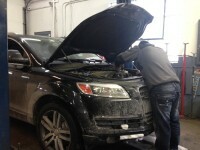 Our car mechanics are the best and provide superior service. Call us today for an appointment and save at least 25% off regular dealer prices.